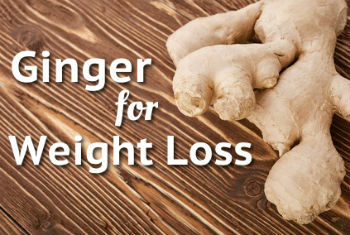 Ginger for Weight Loss | Eat This! Ginger has a variety of health benefits and one of those benefits is weight loss. Multiple studies have found that ginger may promote weight loss when used in collaboration with a healthy diet and exercise plan. It has long been known that ginger soothes the stomach and aids digestion and some studies are looking into the idea that these digestive benefits promote weight loss as well. The idea is based on the fact that optimal digestion uses fuel in the body more efficiently, which in turn may increase weight loss. Maastricht University, located in the Netherlands, discovered that ginger has fat burning and metabolism boosting properties. These properties may aid a person’s weight loss efforts. In addition to increasing fat loss, ginger may also help a person to feel satiated, which in turn reduces food consumption. Researchers in Japan conducted a study on mice and they found that eating high fat foods along with zingerone, a compound in ginger, caused the mice to lose significant weight. Another similar study was completed in Kuwait, where researchers looked at the effects of raw ginger and restricted calories. The mice involved in the Kuwait study lost weight as a result of the combination. If you want to try ginger for weight loss, our favorite ginger supplement is New Chapter Gingerforce . It is an organic, full-spectrum ginger extract that contains compounds not found in other ginger supplements. 1 Comment on "Ginger for Weight Loss"